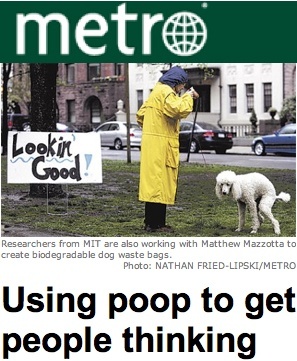 Instead of trying to identifying the culprits of that poop on the grass, dog poop is actually a welcome sight to the residents of Cambridge, Massachusetts, who are happily participating in the Park Spark Project. The objective of the project is to turn dog poop into methane gas and use it for energy. A relatively small amount of dog poop is already lighting one of the dog park's lamps - an eternal light from the power of dog poop. The Park Spark Project is the brainchild of artist Matt Mazzotta who came up with the idea as a way to involve the community in a green project, one that was not dependent on purchasing green alternatives. This is just one way, he suggests, that citizens can create a greener world themselves, making all of us a part of environmental solutions. The dog poop, wrapped in biodegradable bags available at the park, is placed in a tank and is manually broken down by spinning a wheel, which moves it into a second tank that separates the dog poop into methane and water. 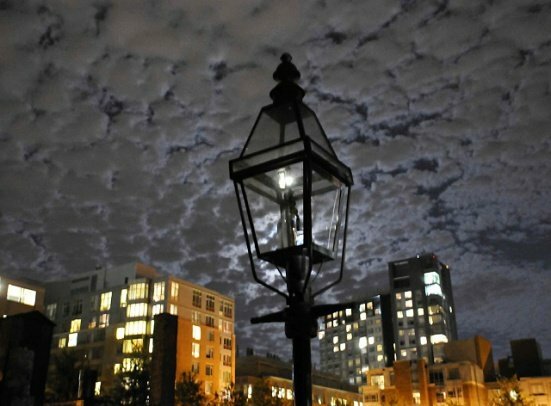 The methane is then burned as fuel to, in this case, power the lamp. Eventually, the fuel will also be used to light art projects in the park. As some of you may know, methane is far more damaging to the environment than carbon dioxide; however, breaking methane down reduces it to carbon dioxide and water, lowering by 30 to 70 percent methane's potency as a greenhouse gas. The Happiest Elephant in the World! Animal Video of the Day!!! Facts About Black Cats -- The Animal Video Of The Day!! !